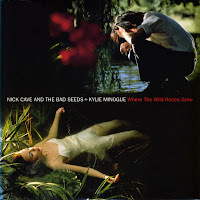 'Where the wild roses grow' was written by Australian singer-songwriter Nick Cave. He was inspired to write it after listening to the traditional song 'Down in the willow garden', a tale of a man courting a woman and killing her while they are out together. The song featured guest vocals by Australian pop-singer Kylie Minogue and was released as the first single from the ninth album by Nick Cave and the Bad Seeds, 'Murder ballads' (1996). It became the band's most successful single worldwide, reaching number 1 in Israel and Croatia, number 11 in the UK singles chart and number 9 in the Dutch Top 40. 'Where the wild roses grow' was also certified Gold in Australia where it sold 50,000 copies.